Birds’ Eye C8 Renderings Of ME With Its Doors Open. Thank you Chazcron! A more proper look at the open doors. I modeled the door sills, but not the interior panel. Last edited by John; 03-31-2019, 02:33 PM. Extremely Nice. I wonder if those doors will be able to have the lambo hinges installed? I can not imagine why that would not be possible. Only take several months for the aftermarket Lambo door companies to engineer the exact hinges/system that would work well. If you ever had to deal with scissor doors you would rather have conventional doors. They are not easy to grab and pull down the door without pulling out your shoulder and back at the same time, which I did and I am still young and in good shape. Makes sense in Italy with small parking lots but I would never park mine close to anyone that I would need those type of doors. I like the Aston Martin doors they have a slit pitch to avoids curbs when parking close to a curb, they pitch up. I thought the C8 was going in this direction. Last edited by Fasttoys; 02-13-2019, 06:38 PM. Am I the only one that thinks that the scoop extensions on the doors look very fragile? Wonder how sturdy they will be. Wonder if the scoop extension is a separate piece or molded into the door skin. If it is molded into the door skin, replacing a broken scoop extension will be very spendy. Good question “emsguy.” One thing we know for sure is that GM has tested them with a machine opening and closing the door using the scoop extensions 100,000 times to insure their durability. However, how durable will they be if someone opens one into a brick wall? That is not yet known. Once again , looks Chazcron ! Somewhere on this site there's a photo of a Ferrari with very similar scoop / door details with the door open. Looks basically the same as what this render shows, and I've not heard of a bunch of broken Ferrari doors. Then again, these cars don't get driven as much as Corvettes do. But as John says, I'm sure this is something GM will have tested pretty thoroughly. Last edited by meyerweb; 02-14-2019, 02:41 PM. or if someone opens a truck door into your car? Hey everyone and especially Chazcron, thank you for these wonderful renders with the doors open! I just made a video about your latest renders hope you all love it! Thanks brinkofspeed for the forum shout out. Seeing all those renderings are again exciting to me, even though I have seen them many times before. Thank you. Last edited by John; 02-15-2019, 08:26 PM. Trust me we don't want them, Plus they are a pain in the A to close when sitting in your seat. 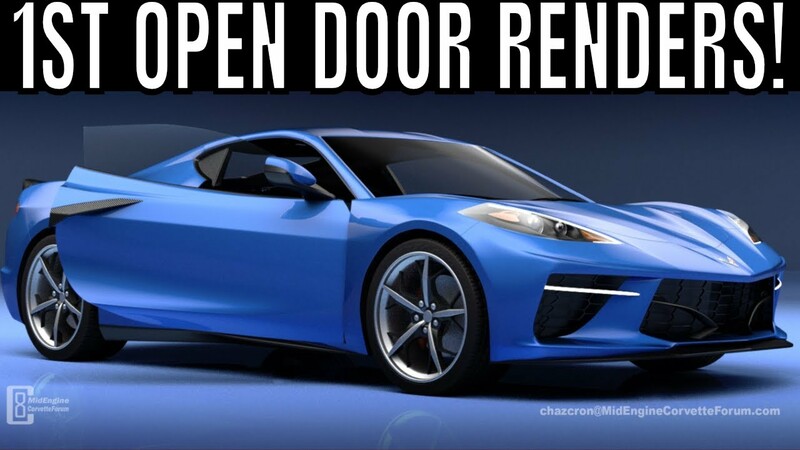 I guess this could be one way for Corvette to lower its buyers age by have scissor doors. My friend John in Dallas has La Ferrari, here are pictures of his car being delivered. He sold through the dealer and made I million after 12 months. Ferrari called him and said he was selected for the La Ferrari convertable which was basically a taga roof. Last edited by Fasttoys; 02-15-2019, 09:00 PM. Ditto; Seeing those ME renderings again and again is still exciting. Thanks BoF.